This is a project that had a few nice results, but was overall very frustrating for me as well as the students. 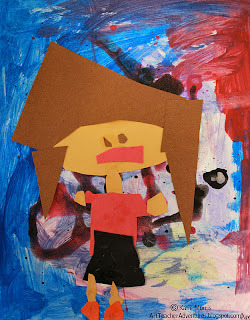 First, we looked at some Abstract Expressionist paintings and talked about how the style looks wild. I started by projecting Lavender Mist by Jackson Pollock and asking the students to just look and think before they said anything else. Then I asked them to share observations or opinions. Some said it was pretty while some said it was "nothing" or definitely not Art. If they said it wasn't Art, I asked them why. I told them it's ok to have different opinions but they should think about the why. I showed the first class a video of Pollock painting but they were super bored so I just showed a photo to the rest of the classes. We also looked at a de Kooning painting so I could show them an abstract style where you can still pick out some recognizable features. Up to that point, everything was going ok. My plan was for the students to make Abstract Expressionistic paintings the first day that would serve as the background for cut paper self portraits. The painting was pretty messy, and there was a clothing casualty when a para's white sweater got paint squirted all over it, but not too bad considering what they were up to! I put out tempera paint in the primary and neutral colors. I got smarter after the first class and took away the black paint. 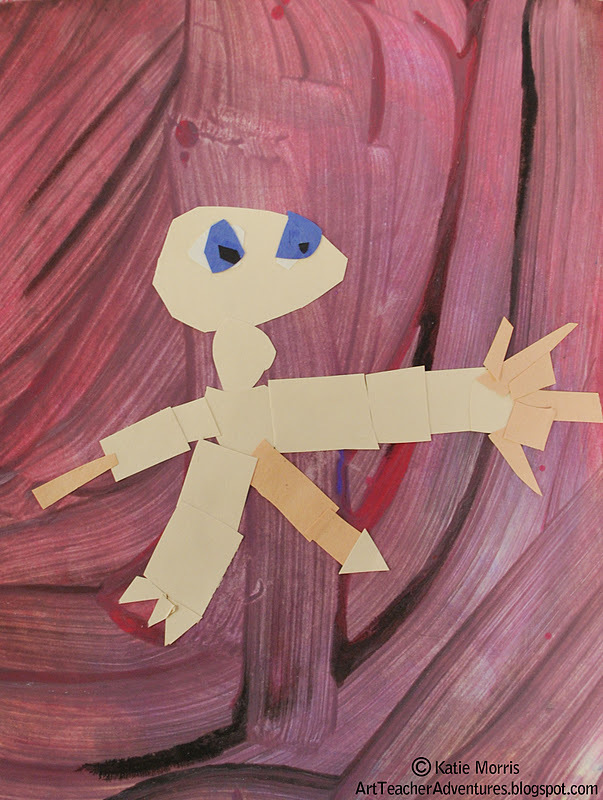 In the second class, I demonstrated cutting and gluing construction paper shapes. I showed the students how they didn't need to cut out the part of the body that would be covered by clothes since it wouldn't show. I think only a few actually did it how I showed them and just made the arms and legs stick out from behind the clothes. Even after tons of reminders that it wouldn't show and things like "you only have 5 minutes left to work so make sure your self portrait has a face and clothes", I ended up with LOTS of little naked people, thankfully not anatomically correct! I think I can usually figure kids out but I just could not get inside a 1st graders' brain and understand why they couldn't let go of having to make the whole body then put clothes on it. I guess because they know their bellies are under their shirts in real life so they have to be under the shirts of their artwork. I dont' know. But none of us were enjoying it enough to add another class so we called it good practice with cutting and gluing and moved on to something else. 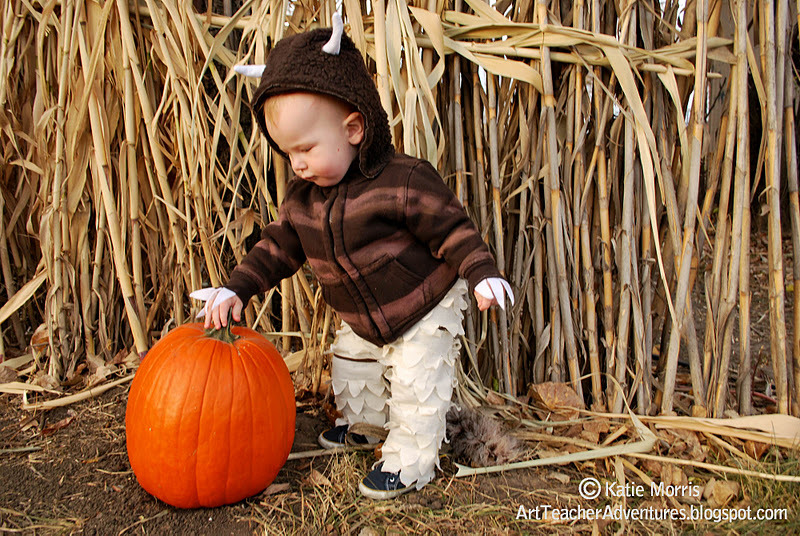 I eventually decided to make my son be a wild thing. I painted bleach stripes onto a brown zip-up hooded sweatshirt then sewed some cheap brown furry fabric onto the hood. I cut slits in the fur so it would fit around the felt horns I made. I really just cut two layers of the horn shape, sewed it, then flipped it so the seam was on the inside. I kind of popped it open with my finger before pinning it down and they really stayed standing up great. They are actually still standing even after being washed since it's a fun jacket now. The pants were a little trickier. 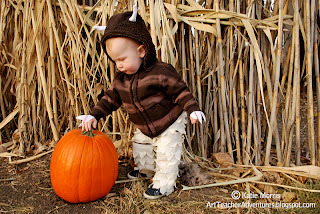 I started with a base of brown sweatpants and covered them with layers of a cream colored fabric cut to resemble the texture of the wild thing's legs from the book. I used fabric glue to help hold it in place while I sewed. I had to sew it by hand and I'm glad I checked it before sewing all the way down because there was a problem: I forgot about the elastic in the pants! When I sewed on the fabric it made the pants way to tight to pull up. So, not willing to give up, I pulled off the layers I had sewn on, sewed them together separately, and added velcro so I could just wrap it around after we got the pants on. I also added a furry looking feather boa from Hobby Lobby (my happy place) to make the tail. So in summary, it took a lot of time and problem solving, and probably didn't cost less than a store bought costume, but I'm pretty proud of it. My mom always made our costumes and I've always wanted to be that kind of mom. Glad that you are candid about frustration. Love that you have a tag for it! I might add that tag to my blog as well. Thanks for posting. We all have projects that go wrong and that's ok. You never know how kids will react - you can do the same thing as last year and it worked great then but flops this time. Who knows?... Anyhow, I love the image at the top of the post and love the costume too. My son is almost 23 - miss the years of fun costume-making. There were a few that I really loved! Forgot to post one by a little boy who gets services for emotional disturbance- he did an awesome job even cutting out individual toes because he said he was barefoot. I may try it again someday with a different grade or just toward the end of the school year.